As soon as I crossed the finish line I caught up with my Mom (Who had flown down from India to see me) and remember feeling great after that. I was not tired at all, I was sore but I felt I could run around 10km at least. One thing I did do wrong was that in the 2 weeks prior to the race, I cut down my running as I was afraid I’d injure myself. Because of this, on race day I found myself 3kg over than when I was training full-on. So basically I put on 3kg in 2 weeks, which is quite scary when you think about it. But 3 weeks on (as I’m writing this) I do think about the time during the race my mind was asking me “What’s next after the marathon?” and I can only think of one response, and that is; “Its no pointing worrying about what’s next?, so long as I know that there will be a another goal soon and I have that to look forward to”. So I trained as hard as I could have and finally it was race time, September 20, 2009 and the gun fired off at 7.30am. 1) I eased into the run, just focusing on getting to the first 14km mark (warm up), I was very stiff as my warm up was not that great (no matter how much you plan things still go wrong, the taxi cab I called for the journey arrived 30mins late and I ended up rushing to the start line – you need to be prepared for these things as well). 2) I carried my own ‘drink bottle belt’ and kept my bottle consistently full so I could follow my hydration plan here. 3) I was aiming for a time of 4.45 and had my “Pace Band” printed out and around my wrist near my watch, this Pace Band also had the location distances for my “personal hydration packs” I had prepared and handed over to the race organizers. These packs basically had a bottle of Gatorade, a Banana and a GNU Gel in each. I didn’t use them all but because I had these packs available to me I was able to have a GNU gel available when ever I felt I needed energy. I honestly believe that as a first time marathoner, if it weren’t for these packs I would not have made it as the refreshments the race organizers provided was terrible, most drink stations had just water. 4) At the end of the first 14km I felt really good, it was starting to get pretty hot and I started to sweat a lot. I upped my hydration after that, drinking when ever I felt like it. I also had a banana and a GNU Gel (Never over drink! As it can cause serious medical conditions like Hyponatremia). 5) After I reached the half way point of 21km I still felt extremely good and even started running a bit faster. I had a GNU Gel as well. 6) At around 30km it was really hot and I was losing a lot of sweat. I started drinking a lot more Gatorade and started having a GNU gel every 30-45mins after this. 7) At 32km I remember feeling really low and depressed, both my thigh muscles started to cramp and I was starting to hear voices in my head. One of the loudest voices as telling me “Even if you finish this, what next? It’ll all be over; do you really want it to be over?” It’s actually a funny thing the mind and how it can completely overpower you when you are fatigued. But I knew I was in the “Chronic” phase and I had started to “hit the wall”. All I can do now is keep running. 8) At around 35km the cramps had spread to my entire lower body and my lower body started to ‘twitch’ making me lose balance a few times and almost fall face down. I just stopped and walked during these times but I never walked for more than a minute and resumed running soon after. 9) At around 40km I got a second wind! The doubt and pain disappeared and I was excited about the finish. I could see the Sydney Opera House and the finish line and actually stepped up the pace with the hopes of getting there quicker. 10) The last 500m was magical, people were lined up and cheering and you just feel so proud. I only have one requirement from myself during the closing phases of every run I do, and that’s t finish strong and sprint at least 200m. I did exactly that and finished at a time of 5:01:25 (5 hours and 1 min). Read my next post for photos and videos. 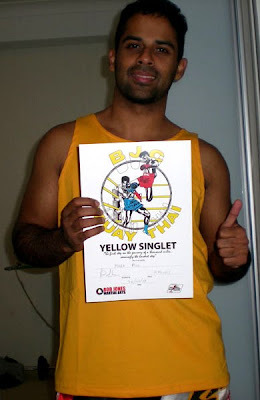 On September 20, 2009 I successfully finished the Sydney marathon in 5:01:25. It’s my proudest achievement to date as it took me three months of full time training and it was still an unimaginable challenge in the end. I thought it would be great to write down the key processes I followed during my training and hopefully it may prove useful to any first time marathoners and help me improve my training processes for my next big race. 1) An overall 3 Months of training broken down into 2 intense weeks sessions followed by 1 recovery week session. 2) On an intense week I aim to do at least 2 long runs and 2 normal runs. The longest run was on Sunday (as the marathon is run on that day) and I keep upping my distance each time I do this run. I usually tried to add 0.5 – 1 km more each time, but some times I could not follow this. But I never ran less than my previous highest distance. If I ran 20km on one Sunday, on the next Intense Week sunder I try to push for at least 20.5 or 21km (more if possible). If I can’t make this distance I somehow at least push my self to 20km. I feel it’s important to maintain this ‘continuous improvement’ as it trains your mind to overcome challenges. 4) Based in my few years of running various races, I realized that each race almost always puts you through 3 distinct phases. I call these phases “warm up”, “chronic” and “home stretch”. These are mental and physical phases you go through. Warm up: This is the easiest phase as your body and mind is ‘fresh’, your excited and looking forward to the experience. You may be a bit stiff but a few km into the race you usually warm up and feel great. Chronic: I came up with this name during a run where I completely mentally switched off. I said to my self “this is too chronic”, I know it does not mean anything but my mind was so switched off I just said it and to me it best describes this phase. During this phase you start to tire and your body starts to get sore. Your mind starts to play tricks with you and starts to make you doubt your ability to finish. The mid way point of a race happens during this phase and that’s when you really start to ask yourself “Why am I doing this?”, “I’ve only made it half way and I don’t have what it takes to go on, lets quit now”. This is normal and so long as you are not physically hurt you have to shut the voices in your head and keep going on, just thinking about reaching the final “home stretch” phase. This phase is usually where you ‘hit the wall’ in longer runs. Home Stretch: During this phase you somehow control those voices in your head and start to realize that with each new step you take, you are getting close to the finish line. Even though by now you are barely able to put one foot in front of the other, you somehow push yourself as all you can think about is crossing the finish line. 5) For my run, I broke off the total distance in to three equal smaller distances and mapped it to the three phases above. 6) When I trained I kept this breakdown in mind and during the race, I only focused on achieving one phase at a time. When I started the race, all I saw in my mind was hitting the first 14km, after I achieved that all I though about was the second 14km and finally focused on the finish line. Breaking long distances into short ones, helps you keep focused and calm. 7) As for diet and nutrition, I usually eat pretty healthy and the only thing I did different for diet was ‘carb-up’ on a night before a long run and never skip meals. As for supplements, I focused on ‘recovering fast’ after long runs so each day (throughout the day and not at one go! ), I took around 2 Mega Men multi vitamins (GNC brand), around 6000mg of Fish Oil, a antioxidant supplement (proven supplement for muscles that are damaged after long runs) and extra protein drinks. 9) And finally, I mentally prepared my self for the race weeks in advance. I did not touch alcohol for 5 weeks prior to race day and I really pumped myself up to have an ‘adventure’, because I make each run I do an adventure I never get bored and can keep running for hours on end. To do your best on race day, you need to ‘start on the right foot’, in other words when you take your first step you should be mentally ‘free and happy’, if you are troubled and afraid of what’s coming up you will start on the wrong foot and the road ahead would be much worse than you could possible imagine. Read my next post for my experience during the actual marathon. I’ve been meaning for a couple of months to post about this and finally got to it. 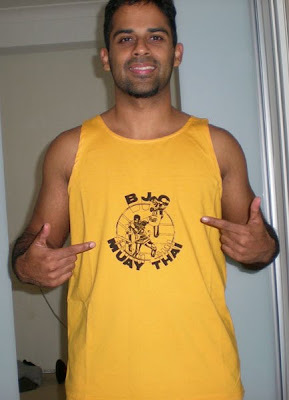 I recently did my first Muay Thai grading with the Fiterite Gym in blacktown. I am very proud to have achieved this and hope it will be the first of many grading to come and singlets to work towards. My fitness, strength and technique were my plus points but I was told to use my hips more is punching to gain more power and to stop dropping my hands during sparring and combos as I seem to drop my hands now and then which is a bad habit and leaves your face open to punches. 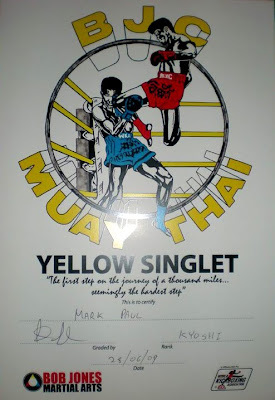 Here are a few pics my of singlet and certificate.